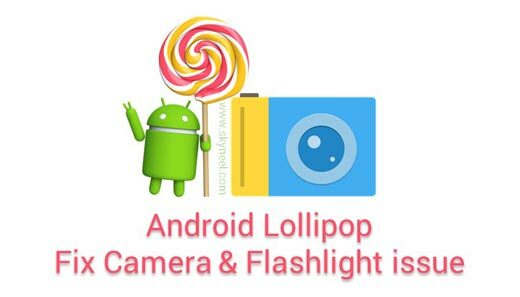 There are many Android Lollipop users complain that their camera has been stop and shows an error message “Can’t connect to the camera” or flashlight is busted. It will be done after upgrading your Android phone with Lollipop. So, today we have to discuss how to resolve Android Lollipop camera and flashlight issue. Android Lollipop camera is very good and improved but some times, it’s get issues. It’s crash, especially when using HDR mod. But don’t worry, here are some simple tricks to resolve these issue and you can easily fix it. There is big group who are running his Android Lollipop on his phone. Sometime they have to face lot of issues due to which they will be frustrated. They want to know proper solution how to overcome this type of situation or how to resolve the issue. Most of the Android Lollipop users camera stopped and you are not able to take the picture with your Android phone. Most of the person have to reboot his Android Lollipop phone to get the solution but they still face this type of problem. During working in the office or at home you have to send few important pictures with your camera. If your phone camera does not working then you will be disturb and don’t know how to take important pictures with your phone camera. In that situation you must have to take the given path which helps you to easily resolve Android Lollipop camera issue. You have to tap on the Settings > Apps > All > Camera > Storage > Tap on the “Clear Cache” & “Clear Data“. After doing this your camera problem will be solved. But if you face same problem then you have to disable the camera for few minutes and again enable your phone camera. Now, restart your Android phone after that your problem will be resolved. Sometime when lights are gone and there are too much darkness when you are alone at your home or in the way. In that situation you must have to use torch of your Android phone. But most of the Android Lollipop users reported that when they leave the flashlight on for a while, for example try to search candle or match box in the dark and it automatically time out. In that situation the flashlight of your Android Lollipop will be busted. Most of the person try to get the solution of flashlight issue. Lot of person seem this issue as a developer bug. But you can get the solution of flashlight issue by reboot your Android phone with the help of power button. After that again restart your phone flashlight issue will be resolved. This type of issue mostly seen in the Nexus 5 smartphone. I hope how to resolve Android Lollipop camera and flashlight issue guide is helpful for all those guys who are facing this type of problem. If you have any query or suggestion regarding this guide then please write us in the comment box.